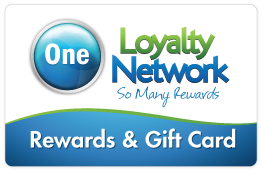 The One Loyalty Network Loyalty and Gift Card is for our loyal customers who are tired of carying multiple loyalty cards to participate in multiple loyalty programs. We'd like you to be in our loyalty network but you need a card to begin with. Once you have a card, we'll show you how to ditch the card and just use your mobile device to start earning rewards at your favorite places. This of course includes restaurants, shopping, entertainment, sporting events and family activities.